My current flock of quail will be past it's prime soon so it's time to add a few new faces. I'd read a few stories about people who managed to hatch 'unfertilised' eggs from the supermarket and wanted to try it myself. So I bought a pack of quail eggs and managed to squeeze 20 of them into my little incubator last week. I was expecting to have to try at least few times, or not get any at all. I candled them this evening and much to my surprise two are developing! I know 2/20 isn't a great fertility rate, but considering that they weren't meant to be fertile in the first place, were packed and sent to a shop in a bumpy truck and then sat around in the fridge for who knows how long it's a pretty good result! I guess either a sneaky male slipped under the radar or they sold a few extra eggs from their breeding birds. WOW - wanna try that now. They both hatched! Unfortunately I'm away this week so no photos. They were both late and sluggish hatchers, and one seems to have curled toes or club foot, but other than that they are both doing fine. Do curled toes often fix themselves or would I be better off acting early to straighten them out? Curled toes need to be splinted (cardboard underneath, sticky-tape or bandaid across top) straight as soon as seen while the tendons are flexible enough, don't leave it for a day or two for it to become an unreasonably painful process, with a doubtful result. Yes, I’d splint them for sure. Impressive that you got two out of it!! The chick with curled toes is doing great. It has gone from hobbling on the side of its foot and part of the leg to walking flat on it's foot with two toes a little twisted. Another day or two of splinting should sort it out. I found that a pipe cleaner splint worked better than cardboard, and that taping the pipe cleaner on top of the foot rather than under it made it much easier for the chick to walk while wearing it. The other chick is fine and dandy. That’s great! Thanks for the update and for sharing your experiences of what worked. Still amazing that they were fertile , haven't seen any california quail eggs yet this season . But been busy hatching blr bantam wyandottes and silkies in with Golden pheasants, on the net says 25 days incubation for the pheasants but they seen to hatch on day 22/23, nine out this clutch so far , nine more to go, oh and have one pheasant hen sitting on a clutch, easy to manage too . Last clutch of Golden pheasants are already out in raising pen at 4 weeks whilst the chickens from same clutch no where near ready., sorry to digress from your post . From where did you get the eggs from will they be jumbo quail. I got the eggs from an asian/gourmet grocery store, I've seen them for sale in other asian grocery stores too. 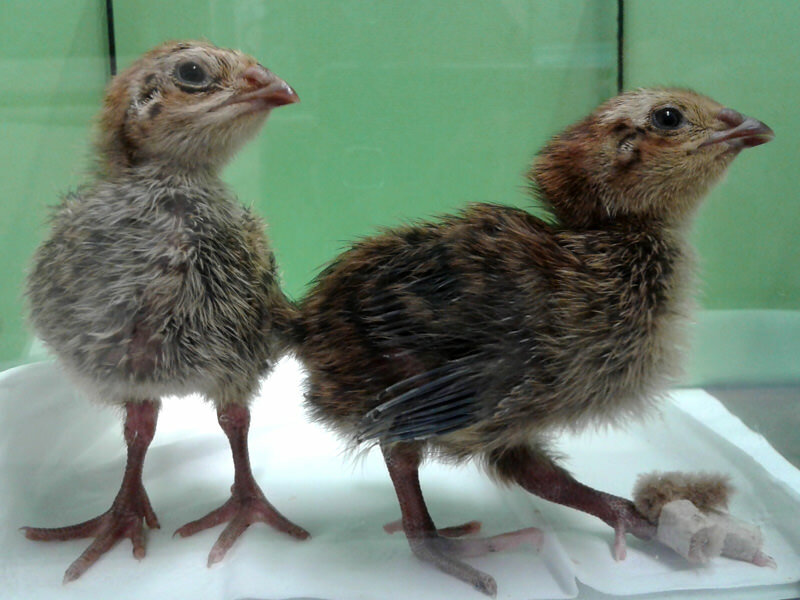 The label says they are from K'Ray's Quail in Yarloop. It looks like they will be dark coloured, but other than that I have no idea what they will be like as adults. It will be a surprise! I found some (not refrigerated either) but in my excitement I bought 3 little cartons - 11/2 doz eggs, you know the size, like a half doz egg carton. I forgot how little quail eggs are - 3 doz going into the bator tonight. Hopefully not 3 doz unfertilised quail eggs. 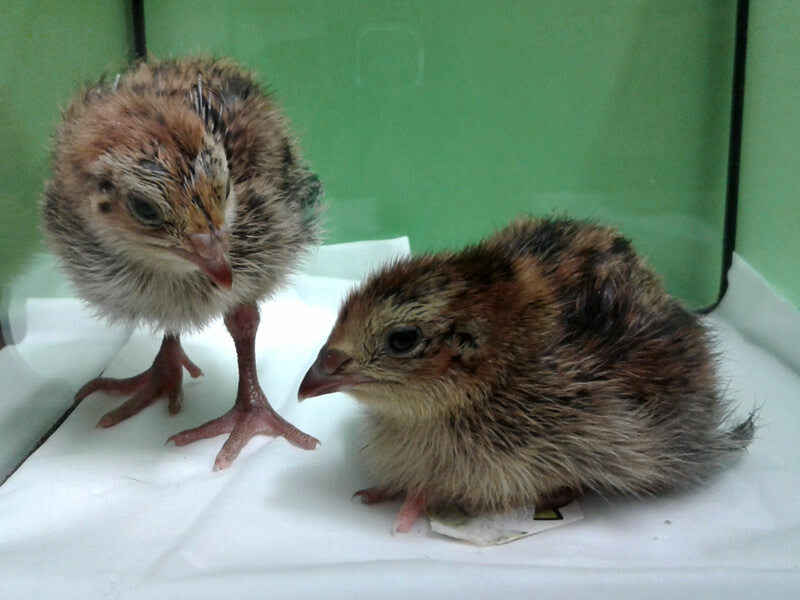 Any thing special about incubating quail eggs that I need to know?